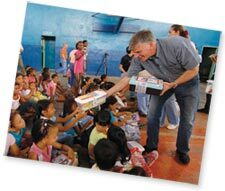 Franklin Graham passing out shoe boxes. Take this opportunity to offer a message of hope to children around the world. 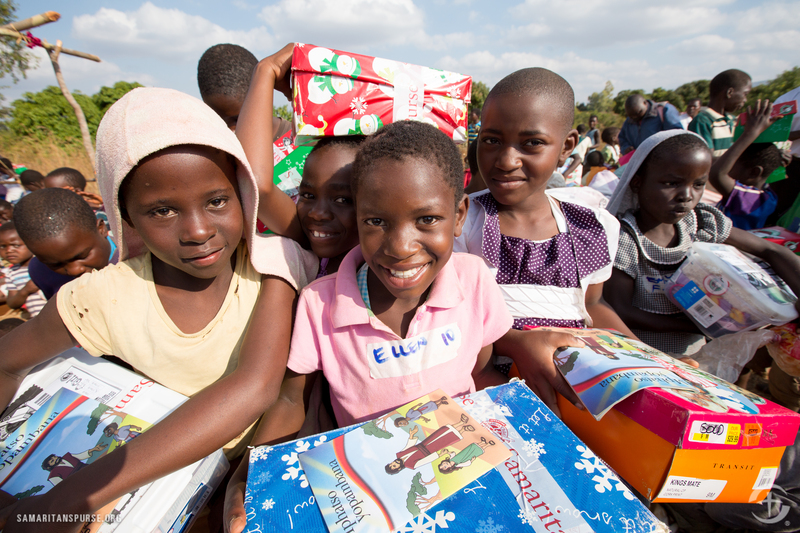 Put together a shoe box of gifts as part of Operation Christmas Child. PACKING PARTY - Nov. 9 at 10 AM in Fellowship Hall. It's never too early to start finding things to fill our shoe boxes. Watch for the sales - you've got lots of time yet before collection day. Toys: small cars, balls, dolls, stuffed animals, plastic kazoos, yo-yos, harmonicas, jump ropes, small Etch A Sketch ®. Toys that light up or make noise (with extra batteries, Slinky, etc. School Supplies: pens, pencils and sharpeners, crayons or markers, stamps and ink pad sets,coloring books, writing pads or paper, solar calculators, etc. Hygiene items: toothbrush, mild bar soap, comb, washcloth, etc. Other: socks, T-shirts, toy jewelry sets, hair clips, watches, small picture books, etc. DO NOT PACK candy or toothpaste. Bring breakfast finger food to share. Bring yourself and friends and items to add to the table to fill boxes with.